Changing the look of your newsletter helps to keep your readers fully engaged and eager to receive the next. Creating newsletters can take valuable time away from other important tasks and may prove to be frustrating when no one bothers to read it! 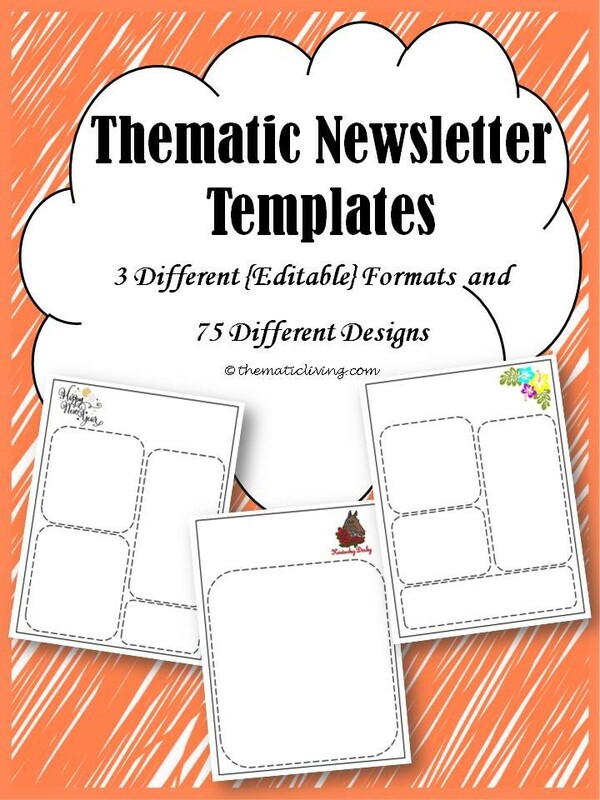 Included in this resource are 3 different newsletter template formats for each of the 75 included themes to keep your newsletter fresh and interesting. That is over 200 pages of newsletter templates! The text boxes are included in each template. Just open the file in Microsoft PowerPoint 2003 or newer, and add your text. It is that simple! This resource was created to save time and look professional while you do so. Looks like you spent hours on each newsletter! Each template has a choice of 3 formats so you can copy and paste whenever you need. They are fully EDITABLE - use the template as it is originally or customize the form to meet your needs. Choose from 75 themes! Choose a template and fill it out. You can choose to print and distribute to your readers, use during open house, or post it in a prominent area. If you would like to email the newsletter to some readers, all you need to do is save the template as a PDF once you have edited it to your liking and email it to whomever you would like.